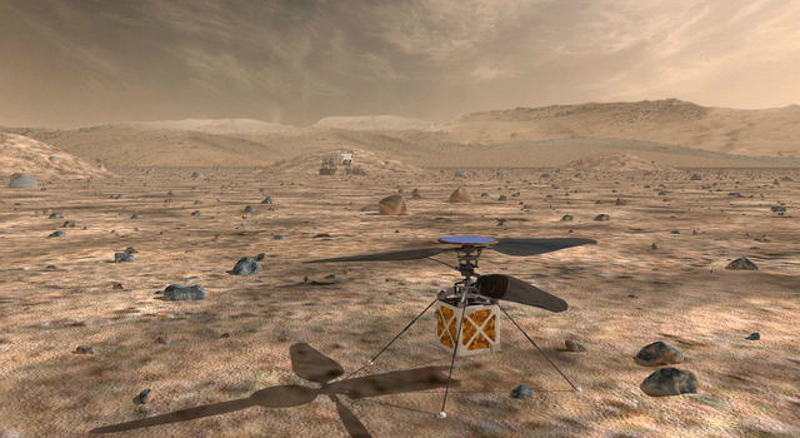 NASA’s Mars Helicopter, a small autonomous rotorcraft, will demonstrate the viability and potential of heavier-than-air vehicles on the Red Planet. According to the 1958 law that established NASA, where the first “A” in NASA stands for aeronautics, the agency is charged with solving the problems of flight within the atmosphere. NASA Aeronautics researchers helped to refine the design and operations of the Mars Helicopter, a technology demonstration that will travel to the Red Planet with the Mars 2020 rover. This first Mars Helicopter will serve as a technology demonstrator that, if successful, will enable future scientists to remotely explore regions of the planet’s surface far from its mothership’s landing site. The problems facing the Mars Helicopter design team were and are daunting. The vehicle must fly in Mars’ thin atmosphere, survive brutally cold nights, and operate essentially on its own since it’s millions of miles from the nearest pilot on Earth. Nevertheless, the engineers at JPL came up with a design that can deal with those concerns, and more. For example, take the Martian atmosphere. At the surface where the Mars 2020 rover is targeted to land, the atmospheric pressure is equivalent to about 100,000 feet above the Earth’s surface. No helicopter has ever reached even half that distance above Earth. Yet the Mars Helicopter will be able to fly as high as about 15 feet above the Red Planet thanks to its two sets of rotor blades – each four feet long, tip-to-tip – spinning at 2,400 rotations per minute, which is about 10 times faster than an Earth helicopter. The smallness of the main helicopter body helps too. It’s only about the size of a softball and will weigh just under four pounds. And while just the act of flying the helicopter at Mars is the main goal, a small camera nearly identical in capability to the average smart phone will take pictures of the surface below for transmission back to Earth. A small but mighty NASA Aeronautics team used computer tools, including special codes, to better understand how the Mars Helicopter would fly in Mars’ atmosphere. It was just after the overall Mars Helicopter concept was defined that JPL sought out the experts at NASA’s Langley Research Center in Virginia and Ames Research Center in California to help refine and test the vehicle’s design and operation. “When JPL asked for our expertise, we put together a small but very effective team to help them with configuration, sizing and aerodynamic performance; along with testing and simulation work,” Gorton said. To do this the team used some of its workhorse computer tools to characterize and better understand how well the Mars Helicopter would fly in the Red Planet’s atmosphere. These included codes used to analyze conceptual design and vehicle sizing called the NASA Design and Analysis of Rotorcraft tool, as well as a more detailed computational fluid dynamics analysis tool known as OVERFLOW. Their work began in late 2013 and has continued to the present, Gorton said, noting that even during the recent government shutdown, one of the RVLT research engineers was called to duty to help assess the data from a round of final testing. “When a vehicle goes to Mars it’s going to have to operate autonomously. When it gets there the whole control system and everything that makes it fly must be tuned so that it can fly on its own, which this final round of testing addressed,” Gorton said. 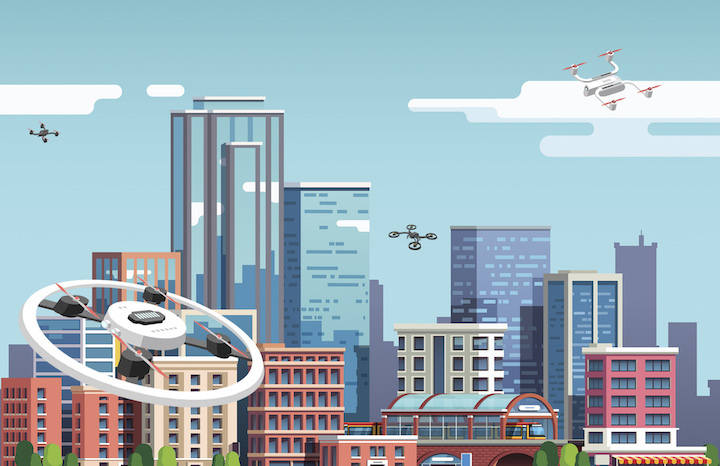 Autonomous operations, like those required by the Mars Helicopter, are also required for safe air traffic operations in urban areas of a new variety of vehicles in the not-distant future. Although not directly linked to the Mars Helicopter in terms of the technology used, the work NASA Aeronautics is doing with Urban Air Mobility (UAM) also requires many of the same kind of autonomous operational considerations, Gorton said. One of the most important elements required for UAM to work is for the unmanned vehicle – whether it is carrying cargo or passengers in or around a large city – to be able to make immediate decisions on its own when something unexpected happens. That could be correcting for a sudden wind shear as it flies between buildings, maneuvering away from another vehicle flying too close, or detecting a technical problem requiring a safe landing as soon as possible. While the Mars Helicopter isn’t expected to run into any other vehicles flying about, a technical problem or unpredicted change in atmospheric conditions could require the vehicle to immediately cut power and gently drop to the surface. “That’s what autonomous operations is all about,” Gorton said. Looking to the future, if the Mars Helicopter works as planned, JPL scientists say future missions to the Red Planet could carry and deploy even more helicopters to extend the scientific reach of the landers they arrived on. Should that happen, and the skies of Mars start to get a little busy with autonomous helicopters flying about, parts of a drone-related traffic management system descended from work being done today by NASA Aeronautics also could find a home on the Red Planet. “Whatever the future holds for flight in our atmosphere, the skies above Mars, or over any other planet that’s out there, we’re ready to share the skills and expertise we’ve gained over decades of aeronautics research,” Gorton said.